CES 2018 has seen a plethora of new products being announced and unveiled. There was a new trend at this year’s convocation, with many products being aimed at emerging segments which help you complete day-to-day tasks. We’ve previously covered a Smart Bed from Nokia, a Smart Shower, and also a smart camera for your skin. 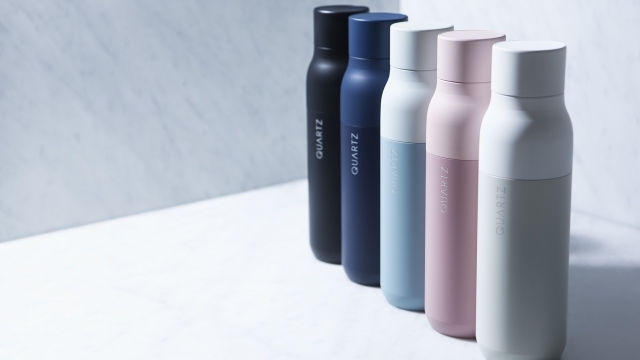 Now, San Francisco-based Quartz has launched a new smart bottle. The ultra-portable 0.53L Quartz Bottle is the world’s first self-cleaning water bottle and water purification system. Using a 280 nm UV-C LED inserted at the bottom of the cap of the bottle, the company claims that the bottle can clean the water inside in just sixty seconds. Furthermore, the cleaning process takes place automatically every four hours, that is, six times a day. According to Quartz, the bottle cleans 99.99 percent of the bio-contaminants such as bacteria and viruses found in water or the surface of the bottle. The company claims the bottle is 10,000 times cleaner than an average bottle and can save up to $1,000 per year when compared with disposable plastic bottles. Thanks to double insulation and vacuum seal, the Quartz Bottle can keep the water cold for 24 hours and hot for 12 hours. Also, unlike other water purification systems, there is no need to replace the filters of the bottle. The Quartz Bottle can be pre-ordered for $79 on Indiegogo. The company is also offering a discount of up to 44 percent when pre-ordering four water bottles together. Available in five colors including Monaco Blue, Granite White, Seaside Mint, Himalayan Pink and Obsidian Black. The Quartz Bottle looks like a great product and could be a must-have for travelers, as well as the average consumer, conscious about what they are drinking.